It looks like a backpack but it’s a woofer. You wear it on your back and feel the magic of music course through your veins. This is nothing out of a sci-fi feature but a musical backpack designed and created by Canadian company SubPac. 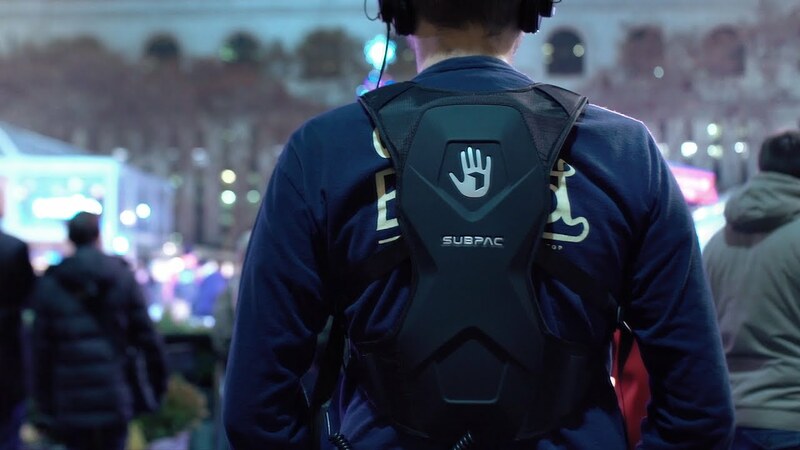 SubPac has created a tactile audio technology that transfers low frequencies of music being played into the body through its strap-on backpack, also called SubPac. While SubPac is waiting for the patent office to grant its application, its ‘musical backpack’ has earned much mileage with music lovers. Even better, this technology opens doors to a variety of communication modes, especially for the hearing impaired. The SubPac M series, launched in 2013, was a wearable subwoofer that was optimized for bass, which made it popular among DJs and gamers who could feel the beats throughout their body. In 2015, SubPac collaborated with electronic music producer Amon Tobin and Peugeot to create a music-based concept car called ‘the Fractal’. This was launched at the Frankfurt Auto Show in September 2015, and featured SubPac technology embedded in seats, allowing every passenger to simultaneously enjoy a bass experience unique to their seat position. Every passenger’s body simply turned into a subwoofer, beating to the feat playing in the audio system. With virtual reality growing into the next big tech phase, SubPac partnered with Universal in June 2015 to create a short VR SubPac experience around the release of Jurassic World: Apatosaurus. How does the SubPac work? SubPac filed patent application EP 3039880 A1 with the European Patent Office on 28 August 2014, describing its technology for a multistage tactile sound device. The inventors have arranged vibrotactile materials across layers of a wearable or seated device. This device (backpack, in this case) draws music either from a wired or wireless signal source, like Bluetooth or Wi-Fi. It then transmits low frequencies of the music – between 5 Hz and 130 Hz – onto the wearer’s body. This bass intensity can be adjusted by the wearer to either increase or decrease the musical vibration. Tactile sound is the sensation of sound transmitted directly to the human body by contact, rather than by sound waves through the ears. Let’s take the example of a railway station. When standing on the platform, you often feel a train passing by, while you also hear it chugging along. The combination of feeling vibrations and hearing sounds is also associated with explosions, crackers, crashes, sonic booms and thunder too. Tactile sound is also present in the vibratory signature of musical instruments, automobiles, in aircraft, someone walking across the floor or slamming a door, and even the vibration from a refrigerator’s compressor. Even when we talk, we experience our voice in tactile. Sub Pac’s tactile technology can play a great role in bettering devices for the hearing impaired. Frequencies of communication can be adjusted such that the wearer of this device is able to decipher a message or spoken communication effectively. If SubPac can be married to communication technology via a smartphone, the hearing and speech impaired will find it easier to use mobile phones for easier speech interaction. With gaming tech being the next big thing happening in the entertainment world, SubPac’s technology can’t be left behind. SubPac’s ability to make a listener feel sounds is helping gamers create subtle audio cues to power up gaming. In the next blog on tactile technology, let’s take a closer look at various products operating in this space, and the patent landscape.